Iranian press revealed on 30 November that the ban imposed on tomato paste exports had now been lifted until further notice, following a letter sent by the Minister of Industries, Mining and Trade Reza Rahmani to the Islamic Republic of Iran Customs Administration on Nov. 21. Exports of tomato paste were banned since October 12 on the order of the Ministry of Industries. Iran has high tomato production, which allows processing industries to meet the domestic demand for the food item used in many Persian dishes. However, excessive exports of tomatoes and tomato paste in recent months, especially to Iraq, for increased profits amid depreciation of Iran's local currency, led to shortages in local markets. The retail price for tomato paste during the one-month period ending Oct. 22, which marks the end of the Iranian month Mehr, increased by 227.8% compared with the same period of last year. 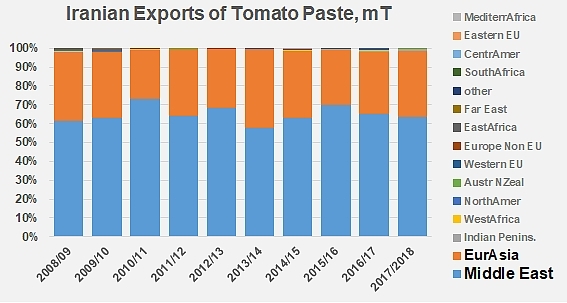 The main markets for Iranian tomato paste are Iraq and Afghanistan; these two countries have drained, over the last three years, more than 90% of Iranian foreign sales of paste.